Week of Welcome (a.k.a. WOW) is a classic UVM tradition - kicking-off the start of the semester with tons of free events, treats, and chances to connect with your friends and campus as we start another semester of UVM goodness. Week of Welcome provides you with a fun, informative way to make new friends, create lasting memories, and provide you with an even closer connection to your new campus. Week of Welcome is the official start of the fall semester. Beginning with Opening Weekend on Move-In Day and extending beyond the first week of the academic year, we (along with countless other UVM departments and organizations) plan tons of fun and exciting events for you to experience once you arrive – from pep rallies and comedy shows to bowling, paintball, free food, free swag, a beach days and more! Winter Week of Welcome (Winter WOW) is a week full of awesome events in January meant to introduce new students (and reacclimate returning students) to our campus at the start of the Spring semester. From free coffee to indoor ice skating, and UVM's annual WinterFest - a winter-themed take-over of the Davis Center, every year there are new events for anyone and everyone to explore. Over 80% of University of Vermont students are involved in at least one UVM club or organization. If you're interested in finding a club or org, be sure to check out ActivitiesFest, our annual club fair for a chance to visit representatives from most of our 200+ clubs & organizations, and scope out on-and-off-campus resources. ActivitiesFest is held annually the beginning of fall and spring semesters. Get ready to laugh it up as UVM Program Board presents UVM’s Labor Day Comedy Show. Join campus and the Burlington community for this annual tradition featuring an evening of laughter and hilarity with some of the nation's hottest comedians out there. Past line-ups have included artists like Pete Davidson, Michelle Wolf, Tig Notaro, Seth Meyers, and more. Adjusting to a new schedule after a relaxing break can be rough - we're here to make those early-morning strolls to class just a little more bearable with free coffee, tea, treats, and some free swag. All week. Monday thru Friday. Because we <3 you. UVM Program Board takes over the Davis Center for a winter party not to be missed. Grab some free food, check out some tunes, judge UVM Fraternity & Sorority Life's Chili cook-off, and participate in the winter goodness events happening throughout the night. Both WOW and Winter WOW are full of fun (and free) events - from food to crafts and everything in-between. Stay up-to-date with events as they're scheduled on UVM BORED our student-run on-and off-campus events calendar. 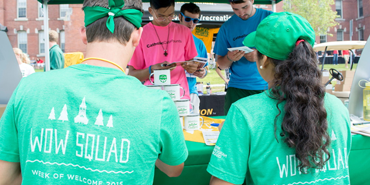 The Week of Welcome Squad (WOW Squad) is a group of energetic students who serve as guides, hosts, and friendly faces to incoming first-year and returning students during the WOW - and they get paid to do it! Interested? Both Week of Welcome and Winter Week of Welcome take place at the start of the fall and spring semesters respectively. Week of Welcome begins in the fall starting with move-in day and lasts throughout the first week of classes (plus a few days). Winter Week of Welcome begins mid-January, lasts the week, and concludes with our signature event - WinterFest. More information is available on UVMBORED. Most Week of Welcome events are free – but a couple of them are not. Events that cost money should be labeled as such on any WOW materials and UVM BORED. Events that cost money or are 'free but ticketed’ have a capacity – so don’t wait to grab that ticket if you’re interested. Tickets for WOW events can be purchased online at tickets.uvm.edu unless otherwise stated on marketing materials. Nope! Any Week of Welcome event that is off-campus will have shuttles to and from the event. Details will be listed in marketing materials. Is WOW just for First Year Students? Nope! All events happening during WOW and Winter WOW are fair game for ANY UVM student to enjoy, regardless of class year. However, during the fall semester, Opening Weekend events (which take place from Move-In thru Sunday) are JUST for incoming first year students (and some of them are mandatory) to help orient them to their new UVM community.